That may very well be true. But was it always true in each of the examples related in the book? When Kiriakou frames a fellow prisoner for a charge of attempted escape, it’s because the prisoner is seriously annoying. “Desperate times call for desperate measures,” Kiriakou writes, but desperation is an emotion, not an analysis of the seriousness of a threat. The punishment Kiriakou earns the man he frames is solitary confinement for months — something that much of the world considers torture. Likewise, when Kiriakou writes that he loathed all child molesters in prison, that’s an emotion, not a survival technique. Maybe it was inexplicable. One could hardly get through a prison sentence without encountering irrational aggression — short of doing time in a civilized prison in Norway or someplace. But is it always unavoidable? It seems in Kiriakou’s account to often be enjoyable. Kiriakou writes: “Sometimes there is real satisfaction in passive-aggression.” “Sweet revenge.” “I just wanted to see the guy lying in a pool of his own blood.” Etc. Torture is different: “At the CIA, employees are trained to believe that nearly every moral issue is a shade of gray. But this is simply not true. Some issues are black and white — and torture is one of them,” writes Kiriakou. 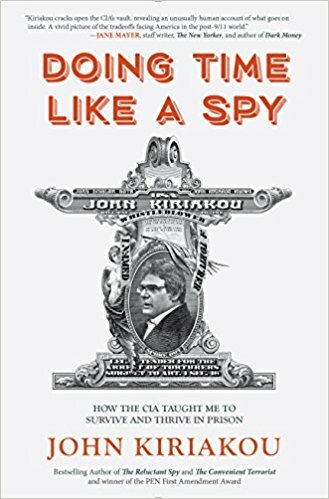 Under great pressure in prison, of a sort I’ve never faced, Kiriakou never writes that he had to repress any urge to torture anyone, only to murder them. What are we to make of an account of the brutality of prison by someone who claims to have survived it by mastering its brutality, yet seems to have taken pride in that and to have learned his brutality working on secret operations we aren’t supposed to know about for a government that is supposed to somehow represent us? It’s very hard to say. Is the author trying his techniques on us in print? I don’t know, but I do know that most readers in the United States will simply nod.